Economists Toast 20 Years Of NAFTA; Critics Sit Out The Party In December 1993, President Clinton signed the North American Free Trade Agreement into law. Presidential candidate Ross Perot predicted Americans would hear a "giant sucking sound" as Mexico vacuumed up U.S. jobs. Economists say that the worst of Perot's fears never materialized. But opponents still see downsides. 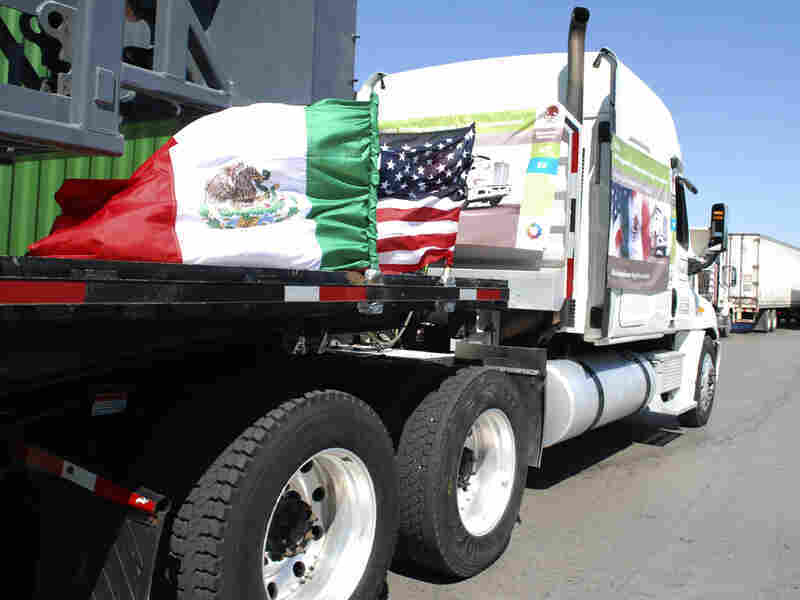 A truck bearing Mexican and U.S. flags approaches the border crossing into the U.S., in Laredo, Texas. Twenty years ago, millions of Americans were cocking their ears — waiting to hear a "giant sucking sound." They feared Mexico would begin vacuuming up U.S. manufacturing jobs as soon as President Clinton signed the North American Free Trade Agreement, or NAFTA, on Dec. 8, 1993. The "sucking sound" famously had been forecast in 1992 by Ross Perot, the businessman turned independent presidential candidate. Clinton won the election, and began pushing for NAFTA's passage. He promised the sprawling trade agreement would become a wealth generator as it pulled together the economies of Canada, the United States and Mexico. Who turned out to be right, Perot or Clinton? Over the years, polls have suggested most Americans don't much like NAFTA, and unions remain sharply critical. But economists generally say Clinton's prediction came closer to hitting the mark than Perot's. "I'd say NAFTA was an overwhelming success," said Sara Johnson, an economist with IHS Global Insight, a forecasting firm. "There are strong, two-way trade flows now." 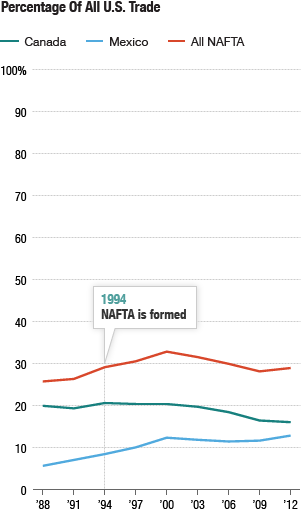 Since NAFTA took effect, trade among the three countries has more than tripled. And while millions of U.S. manufacturing jobs have melted away over the last two decades, economists attribute most of those losses to new technologies and Asian competition, not NAFTA. In fact, if not for NAFTA, even more jobs would have disappeared from this continent, Johnson argues. "Better to have jobs in Mexico than China" because Mexicans buy more of our services and goods, she said. Still, NAFTA has failed to deliver as many benefits as its most ardent supporters had expected, leaving the trade agreement with a relatively muted impact, according the non-partisan Congressional Research Service. "NAFTA did not cause the huge job losses feared by the critics or the large economic gains predicted by supporters. The net overall effect of NAFTA on the U.S. economy appears to have been relatively modest," CRS concluded. Still, it may be too soon to accurately assess the full impact of NAFTA. The deal's real legacy may emerge in coming years as more trade pacts get written and take effect. For good or ill, NAFTA has become a guide for shaping how countries conduct business with each other in the 21st century. The CRS put it this way: "NAFTA initiated a new generation of trade agreements in the Western Hemisphere and other parts of the world, influencing negotiations in areas such as market access, rules of origin, intellectual property rights, foreign investment, dispute resolution, worker rights, and environmental protection." NAFTA went into effect on Jan. 1, 1994. This month, NPR reporters will look at the changing fates of U.S. union workers, Mexican farmers and Canadian manufacturers in the Age of NAFTA. They will consider the impact on income inequality, and examine the role of NAFTA in shaping current trade negotiations. The debates will continue far into the 21st century over how NAFTA changed the lives of 450 million Americans, Canadians and Mexicans as it eliminated most tariffs and duties, created trade rules and established dispute-settlement processes. Below are some of the impacts. -- NAFTA has more than tripled trade among the three countries, sending the total value above the $1 trillion threshold by 2011. Canada is the leading market for U.S. exports, while Mexico ranks No. 2. Together, the two countries account for about a third of all U.S. exports. -- North America has become one integrated market for the production of advanced goods, such as cars, planes and electronics. So when you are buying a vehicle assembled in Canada, it contains lots of made-in-America parts. -- The real advantage for the United States has been in services. American exports of services to Canada and Mexico tripled from $27 billion in 1993 to $82 billion in 2011, resulting in a trade surplus of roughly $30 billion. -- Agricultural exports to Mexico surged after NAFTA became law, roughly tripling in just the first dozen years the deal was in place. 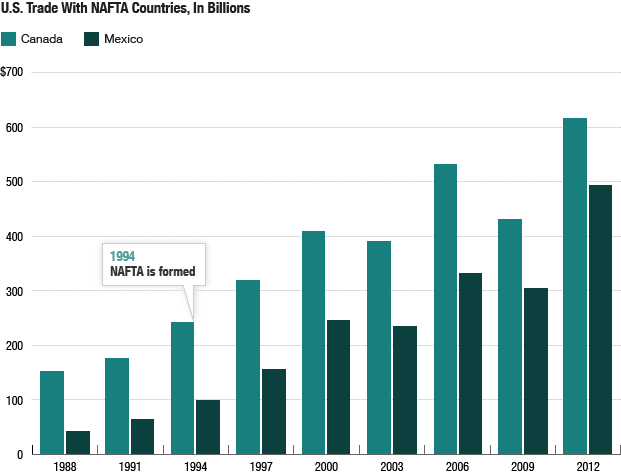 -- NAFTA has pushed Mexican businesses to become more efficient, and therefore wealthier. That helped transform our neighbor from a massively under-developed country into a more stable democracy with a growing middle class. — While Americans who provide services to NAFTA partners are running a surplus, the goods trade deficit totaled $95 billion in 2010. -- Some states have lost a lot of manufacturing jobs to Mexico, particularly Michigan, Indiana, Kentucky, Ohio and Tennessee. The Economic Policy Institute, a research group supported by unions, released a report in 2011 saying U.S. workers have seen nearly 700,000 jobs go to Mexican competitors. -- A lot of the NAFTA-driven business in Mexico took the form of factories along the border, but the jobs haven't been great ones for the workers. Intense competition with Asian and Indian workers may have depressed wage gains for Mexicans. -- The surge in imported food has strained U.S. food inspectors, potentially increasing risks for U.S. consumers. -- Critics say that by disrupting the previously protected small-scale agriculture sector in Mexico, NAFTA caused a surge in illegal immigration into the U.S.